Oksana densely ornaments glass, as her grandmother used to ornament shirts, arranging thousand-year old letters-symbols in texts about perpetual things: Life, Death, Love… One may read into her compositions as into a pysanka, embroidered shirt or an icon, or simply relish the variations of modern plastic arts and gentle emotions of refined pearl coloring. Born in Lviv, Ukraine in 1966. 1984-1989 a student of Lviv of Decorative and Applied Arts (now Lviv Nationl Academy of Arts), department of artistic textile. A member of National Association of Artists of Ukraine. Her working techniques are painting on glass and small-form textile. She teaches at the department of graphic design of Lviv National Academy of Arts. 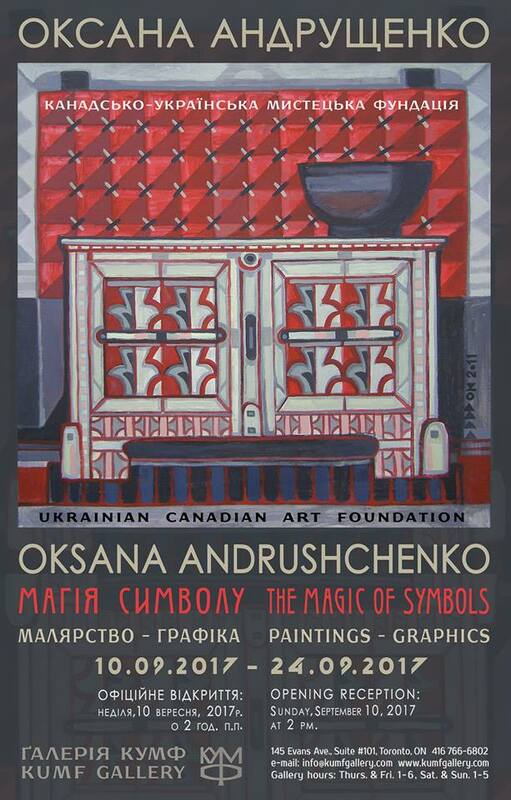 She has a many Exhibits and her works can be found in Ukraine and abroad. Early this year (2017) she was awarded the title – The Honored Artist of Ukraine.